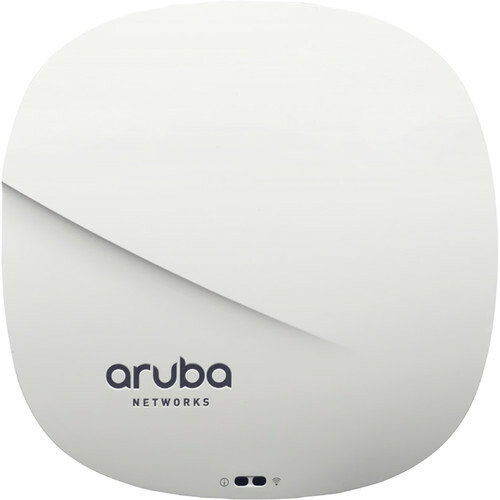 The Aruba 310 Series Instant IAP-315 Indoor Dual-Radio Wireless Access Point from HP offers maximum data rates of up to 1733 Mb/s in the 5 GHz band (802.11ac) and 300 Mb/s in the 2.4 GHz band for an aggregated data rate of 2.0 Gb/s. Each radio supports multi-user MIMO (MU-MIMO) and four spatial Access Point streams (4SS). It provides simultaneous data transmission to multiple devices, maximizing data throughput and improving network efficiency. The unit has four integrated omnidirectional down-tilt antennas that are optimized for horizontal ceiling-mounted orientation of the access point. This dual-radio access point (AP) includes enhanced ClientMatch technology that extends the client steering technology with MU-MIMO client awareness. It automatically identifies MU-MIMO capable mobile devices and steers those devices to the closest MU-MIMO capable Aruba access point. By grouping MU-MIMO capable mobile devices together, the network starts taking advantage of the simultaneous transmission to these devices, increasing its overall capacity. These roaming policies that are based on device types, help customers achieve optimum WLAN performance in a mixed device environment during the technology transition period. The unit features an integrated Bluetooth Aruba Beacon that simplifies the remote management of a network of large scale battery-powered Aruba beacons while also providing advanced location and indoor way finding, and proximity-based push notification capabilities. It enables businesses to leverage mobility context to develop applications that will deliver an enhanced user experience and increase the value of the wireless network for organizations. Note: The maximum transmit power is limited by local regulatory requirements. Also, the conducted transmit power levels exclude antenna gain. For total (EIRP) transmit power, add antenna gain. Note: These maximum consumption values exclude power consumed by an external USB device (and internal overhead); this could add up to 6.3 W (POE) or 5.9 W (DC) for 5 W / 1 A USB device. Box Dimensions (LxWxH) 8.8 x 8.5 x 2.2"